If I could give them more that five stars I would. Haven’t been to the dentist in 14 years and needed some pretty major work. I’m petrified about going to the dentist and they made me feel safe and very comfortable. Had my wisdom teeth roots removed today and still have a lot more to go but they are just perfection defined. Dr Louie and his whole staff are simply as good as it gets. No pain, tons of treatment options that the doctor himself reviewed with me personally over an hour. Will never ever think about going anywhere else. He actually just called me at 9pm from home to make sure I was doing well and insists on a follow up visit tomorrow just to make sure everything is just right. You can not get better than the good doctor and his amazingly awesome staff. Was never left alone waiting for anyone. The staff is happy to sit and chat with you to put you completely at ease. The attention to detail is first rate and I no longer feel uneasy about going to this dentist. PS the view from the practice on the 10th floor of the office building overlooking Hollywood is a nice bonus. Don’t bother going anywhere else! Throughout the six plus years, I have received excellent care and first class professional services from Dr. Louie. All of the intricate and difficult treatments have been virtually painless. Dr. Louie thoroughly explains treatments and options.The entire staff are polite, friendly, very helpful and genuinely care about the patients. Without hesitation, I would highly recommend Dr. Louie to others. October 14, 2014 Interested in a few Veneers I was referred to Dr. Louie. From the moment I stepped in his office I was blown away by his exceptional customer service. Not only is he is super personable but he educated me every step of the way. I appreciate that Dr. Louie recommended Invisalign to me instead of Veneers, as keeping my own teeth would benefit me in the long run. I am elated with the results and how Dr. Louie truly invested his time to make sure I got the results desired. The staff is beyond sweet, professional, and they make you feel like family. I honestly looked forward to seeing these beautiful faces every time I come in. Look no further for your dentist!! September 15, 2014 Dr. Shervin Louie is not just a skilled and fabulous dentist, he’s a lifesaver! I came in because I wanted to find a better dentist to take care of my routine dental needs after having negative experiences with a previous HMO dental group with a bad bedside manner. Dr. Louie and his staff took great care of me from the get go. He also realized that my prior dentist had committed a serious error, borderline malpractice, by charging me for dental work but not actually treating a cavity that had been there for some time. Dr. Louie helped me secure a full refund from the dentist (and a sincere apology over the phone!) and also took care of that cavity ASAP. Even better, he treats his staff and patients with respect, a quality that’s hard to find in a health services professional. Overall, he’s got great credentials, a beautiful office, and is just really really nice. I would recommend him to anyone! August 1, 2014 I was referred by friends who had had veneers with Dr. Louie. I was impressed by the work and their smiles. I had veneers before and when 2 cracked and came off, I decided to try Dr. Louie. I am so glad I did! He made a substantive correction to my bite and my teeth are whiter and brighter. He takes the time to evaluate and consult with you as to the best look for your face. His staff are wonderful. They are patient, supportive, friendly and welcoming. May 29, 2014 I have been to many dentists in my life but Dr. Louie sets the bar way up high and for long as I live, I will always go to him and make sure my family and friends do as well. A good dentist has to have two essential traits: (1) technical expertise; and (2) a keen aesthetic eye. Dr. Louie teaches at one of the top dental schools in the country (where he also graduated from) and is an expert on all matters related to dentistry including the latest techniques and advances (which is so important as technology updates on a faster basis than ever before). Then, he really is an artist when it comes to making the teeth look as beautiful as possible – our smiles are so important, they are the first thing that people see – and he is able to design and create a beautiful smile that looks perfect but natural. On top of that, he is one of the kindest and most genuinely standup professionals I have had the pleasure to work with (a true gentleman and family man ) and he has a gentle hand…very important to someone like me who is a baby about pain. Go to Dr. Louie, you will never go elsewhere again! May 18, 2014 I am so glad that I found this dental office. I moved to LA a couple years ago and was scared and intimidated to look around for a new dentist but am so happy that I chose Dr. Louie. I hadn’t been to a dentist in a couple years and him and his staff were so professional, courteous, informative, and just awesome. The office is pretty central in LA and worth the drive if you are not in the surrounding areas. His office took care of my wisdom teeth extractions (my first surgery ever) and they handled it with so much ease and comfort that I was in and out in an hour. Their dental hygienist is also amazing and she helped guide me to healthy gums and teeth. I will be coming back to Dr. Louie for years to come and have already referred several people to his office. All the reviews were spot on, whether new to the city or just looking for a new office, he’s the best there is. April 29, 2014 I have been a patient of Dr. Louie’s for many years now and haven’t found the need to go elsewhere. Dr. Louie is an excellent dentist who is always dedicated to doing the best job possible. All of the work that Dr. Louie has done on my teeth (and there has been a lot of work done) has been excellent and I have never had a problem after the work has been completed. He is very meticulous and takes his time, which I appreciate. If there is something going on that he can’t take care of (like an implant) he will provide an excellent referral. Dr. Louie’s dental and administrative staff are also excellent and really kind. 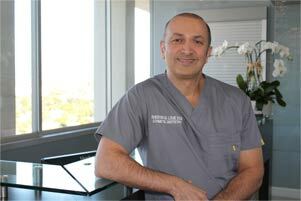 April 14, 2014 Dr. Shervin and his wonderful team are experts! They treat you like family! They answer all questions you have and they really want your teeth to look good as if it were their own. My experience with them really was one of the best dental experiences I have had. They make sure you’re completely satisfied before leaving and fix absolutely anything you ask or are concerned with. March 12, 2014 The BEST! I felt very taken care of from the first time I stepped into the office less than a year ago. From great office personnel who figure out your insurance coverage for you to a recent courtesy telephone call from Dr. Louie the evening after he removed two old crowns for replacement. They are all about as thoughtful, and therefore, calming, as they can be. I don’t know about you, but CALM is what I want to be when I go to the dentist. February 12, 2014 Absolutely AMAZING!! My girlfriend had her veneer, installed by another dentist, it suddenly pop off mid dinner. I frantically called around every dentist on Yelp I could find, but even those still open, at 6:45, wouldn’t take anyone that late. We called Dr. Shervin Louie and even though he had been working since 7AM he stayed open late while we rushed over. They whole staff was AMAZINGLY kind and helpful even though in a panic we left the house without any of our insurance information. The staff at the front desk looked up all our insurance info while the doctor took his time and was patient and compassionate while clearly being amazingly skilled and thorough at his work. All in all fantastic and comforting experience. We will be going back for all our dental needs. Cannot recommend enough!! February 10, 2014 I hate the dentist – but not this one. Dr. Louie and his staff are so nice they actually make the visit as pleasant as it can be for getting work done on your teeth. They are accommodating, understanding, and go out of their way to explain procedures, etc. Best part is my smile looks amazing. Dr. Louie did a fantastic job on my veneers – they look natural and take a few years off as well. November 20, 2013 What a find! I am so dental phobic. Dr. Louie and his staff are just the absolute best. They call and check in on me frequently before and after appointments. And after a recent procedure, my friend was running late to pick me up (I was doing sleep dentistry so couldn’t drive myself after coming out of anesthesia) and Dr. Louie actually drove me home… NO KIDDING. I’m getting over being scared of the dentist and it’s all because of this awesome doc and his equally awesome staff. The best in town without a doubt. November 17, 2013 Dr. Louie and his staff are very professional and very very nice and friendly. I was having dental pain and left a message…Dr. Louie called me back himself, late on a Friday and got me right in on Monday… I’ve continued on with them for all my cleanings and any other work… The office is bright and clean and very welcoming and the customer service is very caring and top notch. October 30, 2013 What a pleasure it is to have Dr.Louie as my dentist. His staff reflects his great wisdom. Always satisfied with the results! My smile is bright and feel fantastic thanks to Dr. SuperCool Louie 😀 Thank you for my great results! October 22, 2013 Dr. Louie is simply a wonderful professional. About 3 years ago I got veneers done in Spain. They are extremely thick, opaque and shaped in a way that is unflattering to my face. I can’t afford new ones at the moment but I was looking for a way to fix the ones I currently have because being so dissatisfied with my mouth was emotionally impacting my personal and professional life. I found Dr. Louie online, saw his great reviews and decided to get an appointment. And I just couldn’t be happier. He completely understood my situation and worked with me so we could redesign my smile just by shaving some of the veneers. The result was amazing. Huge improvement. He has a fantastic eye and knows exactly what needs to be done. When he does cosmetic work, he not only evaluates your teeth and the way the veneers (or crowns or whatever the treatment) would fit your mouth, but he also analyzes the way they suit your whole face, something which I feel is often overlooked but it’s so crucial. In addition to this, the staff is absolutely sweet and friendly and they make you feel completely at home. I kind of felt like I didn’t want to leave and just wanted to stay and hang out. Lovely people and amazing professionals. October 18, 2013 Best dental office I have ever been to. The staff is friendly and incredibly knowledgeable. They don’t overcharge, and you get in and out very fast. The treatment is absolutely the best. So if you’re new to LA and looking for a dentist (as I was), then this is the place to go. 1. Was I going to be judged about the horribleness of my teeth? 2. How much was it going to hurt? Here are the answers: 1. these guys aren’t judgmental at all. I guess if you’re the type to act judgy, you should find another line of work. Everyone there is fun, adorable, sweet and do their best to talk you out of anxiety (mine was pretty high). 2. The stuff I thought was going to hurt didn’t and the stuff that hurt didn’t hurt that much. I don’t think my pain tolerance is high. Anyway, Dr. Louie numbed basically my entire head so I didn’t really feel much aside from “pressure”. Lots of pressure. It’s an odd feeling – not exactly pain. Don’t let fear of pain keep you away from the dentist, especially this guy. Dr. Louie has a well practiced hand; gentle but firm and he asks for constant feedback and gives it, too. It’s about as ideal a setting for a dentist visit as you’re likely to get. And if you’re still afraid of pain I think they can dope you up, too. For me I probably could’ve done with something to ease the tension like a couple tequila shots, but it went away soon enough. The not knowing was the worst part. August 15, 2013 I have had a fear of dentists my entire life until I found Dr Louie. I love Dr Louie and his entire staff! I had an enormous amount of work done through out the years and it was all done as comfortably as possible with me knowing exactly what was happening with each step of the process. August, 6, 2013 Dr. Shervin Louie and staff are extremely efficient and provide top notch service. From, teeth cleaning to implants, Louie and staff provide excellent information and care. He really knows his stuff and he’s very good at making you feel comfortable and at ease. Loving my dentist and his staff is a hard thing for people to believe, but I do. This office has amazing assistants who are not only very good at what they do but are all very kind, patient and helpful. I was treated with the utmost respect and professionalism from every office employee. The dental treatment I received was far above my expectations, too. Every Doctor should model his/her office after Dr. Louie’s. They actually treat you like you matter to them. What a refreshing experience! I continue to look forward to many years of care at this office and recommend his services highly. July 25, 2013 I went to see Dr. Louie today and had a wonderful experience! The receptionist (Ica) was very nice, and made sure I was comfortable in the waiting room, although I didn’t have to wait for long. Dr. Louie was friendly too, listening patiently as I explained my situation (I’ve had braces twice already, and unfortunately, need them again. Make sure to wear your retainers!!). After looking at my teeth for a few minutes, Dr. Louie explained that I would definitely need braces, and could even go with a few brackets instead. Because he only does invisalign, he wouldn’t be able to help me, and I greatly appreciated his honest consultation. He could have easily given me an invisalign treatment that doesn’t work; instead, he referred me to another orthodontist. I still have a dentist, but whenever I’m ready to switch, I will definitely come here again. Dr. Louie is simply wonderful !!! I magically found him on a google one day looking for cosmetic dentistry and he was one of the top ones to pop up. Checking his reviews, everyone claimed him to be wonderful so i decided to check him out. April 22nd, 2013 Being English it is mandatory not to go to the dentist for decades at a time. This misguided cultural tradition finally took its toll and I required extensive dental work to make my mouth healthy again. Suffering from dental anxiety, Dr Louie and his staff did everything they could to put me at ease. I required two IV sedative appointments and the anesthesiologist Dr Louie works with, Dr Rosenblatt is amazing. The last appointment was done with no IV and I can honestly say the 4 hours whizzed by with no pain or discomfort, the end result being a mouth that feels healthy and clean again after so many years. I can’t thank them both enough for helping me to get through what had become a serious problem. I highly recommend Dr Louie to any one who is looking to find a new dentist. March 18, 2013 When one of my upper molars broke, leaving a sharp fragment above the gum line, I was dreading a painful tooth extraction that I expected would leave me in agony for a solid week or more. However, I absolutely had to see dentist right away, so I did a web search and decided to give Dr. Louie a call. I spoke with Angela, who answered all of my questions in a friendly, professional manner, and, best of all, she scheduled an appointment for me right away. When I arrived at the office, Dr. Louie’s assistants Mina and Alla took x-rays and prepped me for the procedure, explaining each step along the way. Their high level of competence and concern for the patient’s comfort really put me at ease. Dr. Louie reviewed the x-ray results with me, and outlined all the possible treatment options clearly. His administration of anesthetic was by far the most skilled I have ever experienced—at no time during the procedure did I feel any pain whatsoever. And, much to my surprise, the extraction took only a few minutes to perform. Dr. Louie and his team are true professionals who really know what they are doing, and I give them my highest recommendation. December 28, 2012 Being severely dentist phobic my teeth aren’t great,but,Dr.Louie and his wonderful staff are amazing at making sure the whole ordeal is as painless and easy as possible! He doesn’t lecture you on what you haven’t done to take care of your teeth he just puts you on a path to want better teeth! Thank you SO MUCH Dr.Louie and staff for making my experience a good one! You WILL see me again! November 27, 2012 Dr. Louie was very knowledgeable and caring. He made me feel very comfortable, which is a lot considering he performed a crown on me after a root canal! His staff is very friendly, helpful, and will assist you in figuring out how to finance your dental work. I recommend him highly to all my friends and co-workers. August 30, 2012I came to Dr. Louie after years of dental anxiety had left my teeth in a very sorry and embarrassing (not to mention painful) state. His manner, and that of his staff, quickly established a comfort and trust level that allowed me to go forward and commit to doing all the work I needed, which was a monumental commitment. I had a wonderful experience over the next few months, as Dr. Louie and his staff made me feel comfortable in the dental share. And more important, the results are spectacular. I am so glad I found Dr. Louie. I went to Dr. Louie for a consultation and informed him that he was my first of several area dental consultations. I will be honest, I was looking for the best deal monetarily speaking but guess what, I came back because you can’t put a price on your health and the level of comfort you feel with your doctor/dentist. In the long run, the quality of work will save you money. Staff and Dr. Louie are so cool that you will probably want to hang out with them outside of the office. Haha, well maybe in my case. 🙂 Cheers! July 18, 2012Finally, I have found a great dentist! First off, the staff is awesome! Everyone is so friendly and personable. I had two badly infected wisdom teeth that were causing a lot of discomfort. I had put off getting my wisdom teeth pulled out because I was absolutely dreading the process of teeth being pulled out of my mouth. Not only was Dr. Louie able to see me and evaluate the severity of my condition, he was able to do the extraction, and I promise you, considering the bad shape my upper wisdom teeth were in, he made sure I was comfortable, and worked extremely fast. He saw me promptly at 1pm and I had everything done by 3pm. I have the bottom two that have to come out still, but now I’m not dreading going back. Thank you Dr. Louie and your incredible staff! July 18, 2012I’m new to the area and I called before they were actually open. They were so accommodating and nice! The staff was awesome and from start to finish it was really a great experience. Easy to locate and the view of Hollywood from the offices are priceless! I would definitely recommend! May 2, 2012Dr. Louie has been our family dentist for over ten years. He has taken care of all our dental needs, so that we all have beautiful smiles and healthy teeth!!!!!! Not only is he a perfectionist and gives his patients the ultimate care, but He and his staff are some of the most genuine, warm and caring people I have ever met!! thank you so much !!!!!! April 26, 2012They made sure every single question I had was answered, and are always available if I think of any more questions I want answered. Their staff is the most friendly, welcoming staff I’ve ever dealt with. They are so warm and professional, and make the whole experience that much better. I was so impressed with the progress I was able to make after visiting them. All my questions were answered, and I feel a lot more confident and hopeful about the future. My dentist-phobia has finally been cured! Never have I ever looked forward to going to a dentist, but it’s hard not to love your dentist visits when they are filled with friendly smiles and a comforting environment. I have been going to Dr. Louie for a little over a year now, and I could not be happier. This whole process started when I wanted to get some work done on my front tooth, I had chipped it my freshman year of college, and I was worried that the half-dead tooth was going to cause a problem.I probably visited over 5 different dentists for consultations, and I felt that Dr. Louie ranked #1 in terms of professionalism, honesty, and patient care. Other dentists suggested extra work, going to a root canal specialist, additional x-rays, etc… the list can go on and on. Dr. Louie cut straight to the point, and gave me several options as to how we can proceed. We worked together as a team, and discussed the steps we need to take to get my perfect smile. He made me feel like my input and feelings were taken into consideration, and I felt really safe doing such an important procedure under his watch. During the procedure, Dr. Louie took his time in explaining every step of the process. I think it’s great that I was so well-informed of what was going on, and he frequently checked in with me to make sure that I was doing alright. You will never be left in the dark with Dr. Louie, every patient is knowledgeable of the procedure’s length of time, possible side effects, long-term consequences, as well as the financial plan. You are his #1 concern when you are in that chair, and your well-being is of he utmost care. He will always call you later that night to check-in with you. I don’t know of any other doctor that goes the extra mile for his patients like Dr. Louie does. Highly recommended for those of you that want to overcome your fear of dentists (like myself), Dr. Louie is a cure-all. In the mid-fifties I became a dental patient of Dr. Robert Willey and was with him til he retired. Dr. Ronald Kaiden took over his practice, and I stayed on with Dr. Kaiden. Both dentists took excellent care of my teeth.In 1999, Dr. Kaiden retired and I again inherited a skillful, considerate dentist in Dr. Shervin Louie. Since I am 80-plus,plus, I credit all of them, and their staff, for preserving my teeth so well. I do hope Dr. Louie does not retire for many years to come since I do not want to break in any more dentists. Dr. Shervin Louie has been caring for me for the past 11 years. We have gone through many technical processes to get to this point and always with care and concern for comfort, alignment, and long-term positive results. Dr. Louie calls in the evening of a procedure to make sure that a patient is comfortable and he shows by action that he is available to deal with any concerns.The office personnel, hygienists, and Dr. Louie have always been professional and thoughtful in their care. It should also be noted that the level of sophisticated equipment and technique that he brings to his practice, perhaps emanating from his work as an Adjunct Professor at USC’s dental school, help make Louie’s own work exemplify the best that can be anticipated in a dental practice. I and my wife are very pleased to have Dr. Louie as our family dentist. He has always been professional and more than capable in handling our individual dental needs. I went here because of other reviews. I had not been to the dentist in years and became paralyzed at the thought of being scrutinized and fearful of facing my poor dental health. If you have these issues or others, RUN don’t walk to Dr. Louie’s caring dental practice. So technologically equipped, non-judgemental, ang genuinely nice, caring skilled people. I can sleep again at night and am going to look great. Minimal discomfort and willing and able to do what it takes to make the procedures painless and 100% perfect. Dr. Louie educates and spends time explaining all.Not cheap, but worth your trust and hard earned dollars. This will be lasting dental care. Dear Dr. Louie,You are a terrific Dentist. I like to call you the Michelangelo of sculpting beautiful teeth. For me, you are the gold standard of dentistry…. And your staff of beautiful assistants : Mina, Alla, Angela and Susan are always a pleasure to look at and talk to. I look forward to many more years of the first rate professionalism you provide to me and all others. It is my experience, having had lots of dental work with many dentists on both the East & West coasts for several decades that Dr. Louie is the best dentist I’ve ever had.He is patient, easy to talk to and sensitive to one’s needs and concerns regarding dental work. Needless to say, his dental results are beyond compare. In short, a first-class dentist. The icing on the cake regarding Dr. Louie’s practice is his outstanding, friendly, knowledgeable (and attractive!) staff. R. B. Los Angeles, CA. Dr. Louie is a fantastic Dentist.I came in after approximately 20 years of neglect and Dr. Louie and his staff transformed a disaster area into the perfect smile. Yes Dr. Louie is a fantastic Dentist. But the real reason to go to Dr. Louie is his support staff. They are as professional as they are caring and accommodating. Alla, Angela, Colette, Mina, and Valentina, these ladies are the real jewels in Dr. Louie’s crown. Dr. Shervin Louie has been our family dentist for the past twelve years. He has seen us through normal cleaning, caps, root canal work, an implant, and general dental care. He is caring and kind and aware that a patient may have fear of the work going on in one’s mouth. He is patient and careful, so careful that I usually double my time on the local parking meters since he takes longer than he initially indicates. As he checks his own work, he is self critical to the point of making sure no one could do the dental care better.The office has seen stability in staff and the people he employs know your name and spend time speaking and sharing while doing their work. We share complete confidence in Dr. Louie’s professional expertise and approach to our dental health. Dear Dr. Louie:I would like to take this opportunity to thank you for your expertise as a Dentist, and for targeting and diagnosing the problems I was having with my mouth and teeth. I appreciate and value your advice and the treatment options you offered me in order to correct the problems with my gums and teeth. For example, the removal of the mercury fillings from my teeth and replacing them with better materials have given my mouth a better appearance, and has also eliminated the possibility of mercury leaking into my gums. In addition, by recommending changing my removable bridge to implants and straightening my teeth, my mouth feels better; I have a better appearance, and I no longer have to remove and clean temporary bridges. I really appreciate the natural look of my upper dental bridges. Dr. Anson the implant specialist who did the dental implants did a wonderful job, and both of you make a great team. Thank you for recommending Dr. Anson. Finally, thank you for your excellent and professional work and for the professionalism of your staff. Dear Dr. Louie,Four implants and a beautiful smile. I had a full upper denture with which, of course, I had to use dental adhesive (mostly paste). Although I could eat most foods, certain ones were difficult to chew and off limits — but I really loved my denture. During the consultation, Dr. Louie explained an important dental fact to me — an ordinary denture alone could not preserve the bone structure of my upper jaw — and slowly but surely even the facial structure would change. Besides protecting the architecture of my jaw, my implants allow me to eat foods like apples, steak, and even nuts. My particular implant denture is no longer a full palate denture but a “horseshoe” which allows my real palate to come in contact with food. I can now savor the taste of many more foods — and I hadn’t even realized that until now!! Add to all of this, my implant denture is nearly permanent, since I do not remove it except to clean it. I am in the process of learning how to speak properly with the implants. I suspect I am a little more demanding than some others since my profession (a college professor) makes communicating very important and requires that I be able to enunciate clearly. — And, good progress is being made. Dr. Louie and Dr. Anson make a wonderful team. This is my second series of implants with this competent and kind partnership — and I couldn’t be more pleased! Dear Dr. Louie,This is a thank you to you for giving me back my love to smile. One of the most wonderful compliments to receive is to have someone tell you, “You have a beautiful smile,” They say that now and I happily smile and say, “Thank you Dr. Louie.” Thank you for your amazing talent and caring. Dear Dr. Louie,As a young woman I had very good teeth, but the years are not kind to a smile. By the age seventy my teeth were unrecognizable from my former self. Thanks to you and your staff I have my old smile back only it is much better. Everyone tells me I look younger, and I just smile. Dear Dr. Louie:As a woman at the tender age of 39 I had to come to terms with the fact that I would have to lose seven of my front teeth due to advanced gum disease etc. Pretty scary stuff. I went to another dentist in Los Angeles and was told I wouldn’t be able to have implants and if I did they would look too long due to gum shrinkage. I was looking at wearing a temporary appliance for the rest of my life. Now I’m really frightened. I was referred to Dr. Louie and from the day I first met with him I stopped being scared. His attitude was so positive that I walked out excited about what my new teeth would look like. It was a long road and a lot of work but with Dr. Louie’s wonderful mix of professionalism, thoroughness, perfectionism and humor I was able to get through what could have been a traumatic and stressful experience. Other dentists were daunted by my case but not Dr. Louie. He was determined to give me a smile that would be lovely and natural. When everything was done my happiness was matched only by how proud Dr. Louie was of his work. He should be – I look pretty darn good and these new teeth will outlast me! Also, I can’t forget his wonderful staff. Everyone was so friendly and they made me feel comfortable and secure from day one. Thank you Dr. Louie and your staff for everything. I can honestly say I now look forward to going to the dentist! Dear Dr. Louie,It had to have been a surprise when the new patient from the trendy and expensive area of Los Angeles opened her mouth and revealed teeth that looked like she had been living a life of poverty in a Third World country. Due to a combination of genetics, neglect, poor health and plain stupidity, the majority of my teeth were either missing, cracked, badly stained or visibly decayed. It had taken 10 years, but I had finally gotten to the point that I had to either overcome my extreme fear of visiting the dentist or never again be able to look at myself in the mirror. Instead of throwing up your hands and showing me to the door, you calmly and convincingly told me not to look back and assured me that you would come up with a plan to fix my teeth and that the process would be as painless as you could possibly make it. Little did I know I was putting my fate and my mouth in the hands of probably one of the most skillful and knowledgeable dentists in Los Angeles. Five short months later, after a combination of veneers, porcelain crowns, and dental implants, I can honestly say that not a single actor who attended the recent Golden Globes awards had a nicer smile than I have. I know because I checked everyone of them. Thank you, Dr. Louie, and your wonderful, caring, and professional staff for giving me back my positive outlook and smiling face. There really aren’t sufficient words to tell you what a difference you have made in my life. Dear Dr. Louie:I would like to take this opportunity to express my sincere appreciation for the outstanding service provided by you and your highly competent staff. You will recall that I was referred to your office as I needed significant oral reconstruction done. Your professional demeanor along with your expertise and empathetic approach gave me the reassurance that all would be well. Today, I have a beautiful smile, great functionality of my mouth and most off all I feel 20 years younger! Thanks to you and your team for the outstanding services provide. It is a great feeling for me to know that I am being cared for by highly competent professional folks who truly have a passion for what they do. I look forward to many years of professional relationship with you all. I will be sharing my experience with several of my friends. Dear Dr. Louie:Thank you very much for giving me a smile to be proud of. I am so pleased that I had the dental work. It took quite a long time, but was well worth it. It also made me realize that art and science plus skill are all part of dentistry and your expertise in this field should obviously be well recognized by your colleagues and patients. You are very fortunate to have such a wonderful staff including your hygienist. I find they are always friendly, most kind and caring people. Once again, thank you and all the best. Dr. LouieDuring 2004 Dr. Shervin M. Louie completely transformed my smile. How good it is to know that my teeth look wonderful. When I met Dr. Louie my upper teeth showed the effects of years of dentistry in three countries. Not only were the many crowns of different colors, but the teeth were slanted and uneven. Dr. Louie patiently explained what could be done, and what would result if action wasn’t taken fairly soon. The work took some time, but it was evident to me that Dr. Louie was a perfectionist, and that nothing but the very best would be the result. There were x-rays, impressions, and, of course, time in the dentist chair, but a great effort was made to ensure that no pain was experienced and that I was completely at ease. I was even offered the chance to watch a movie! The result is quite amazing, as the new teeth look very, very real, and disappear into the gum line, just like real teeth. The time and expense spent for the new teeth were well, well worth it. My thanks to Dr. Louie and his staff for my new, beautiful smile. Dear Dr. Louie,Just a Brief note, on the eve of my trip to England, to thank you and Dr. Louie for being so helpful and accommodating towards my sister. As we all know, there is nothing worse than toothache!, and thanks to your efficiency, Dr. Louie was able to provide Helen with excellent advice and great deal of comfort. Knowing the somewhat parlous state of Dental Industry in England perhaps Dr. Louie will give some consideration to opening a practice there! Dear Dr. Louie,I want to take this opportunity to thank you for my incredible dental restoration. The difference in my appearance and my dental health is remarkable. You were able to rebuild what would have taken years of orthodontics corrections. I had no idea and therefore didn’t realize how difficult this project must have been. My results are a testament of your skill and knowledge. As a corporate image consultant and professional speaker, my appearance is directly connected to the success of my business. Clients must have confidence in my credibility and knowledge in my field. My gratitude and appreciation is only exceeded by my beautiful smile! Dr. Louie:On the wall of your waiting room there hangs a plaque from the American Dental Association whereon you are named one of the finest practitioners in the United States. This award was reassuring to read as I awaited our first meeting and now that I’ve completed our adventure in restorative dentistry, this insufficient note is my personal ratification of the ADA’ s confidence in your extraordinary abilities. Your own expertise and that of your warm and professional staff have brought about results that exceed expectation and our doctor-patient relationship has comforted me throughout the process. Thanks to you and your office, my smile and my personal and professional lives have markedly changed for much the better. It means more to me than words can say. The American Dental Association knows a fine dentist when they see one and so do I. Thank you, Dr. Louie.